Designed to be the best double stack mag belt holster for Polymer magazines available today, the 1791 GUNLEATHER MAG 1.2 holster offers ideal conceal-and-carry with a slim, comfortable profile and quick, OWB draw. Made from fine leather in your choice of dye, you’ll find the lightweight durability of our holsters can’t be beat. 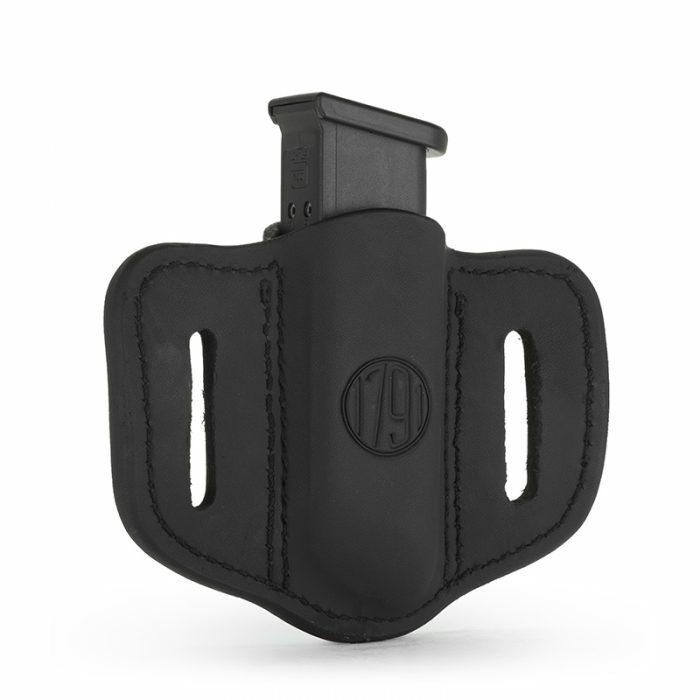 Whether you’re in law enforcement, an avid sportsman, a veteran, or a patriot, you deserve a sturdy holster that will keep your extra rounds in place and allow easy access when you need it. 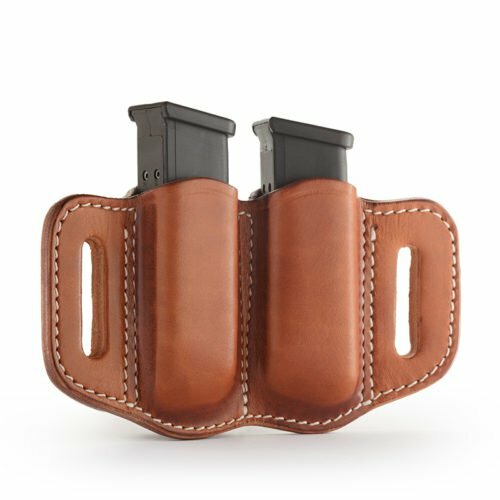 The 1791 Gunleather Single Magazine Holster measures 4.5 inches high by 5.5 inches long, equipped to fit standard-size polymer double stack mags. Our leather magazine holster will fit 9 mm, 10 mm, 40 caliber, and 45 caliber rounds, and fits belts up to 1 & ¾ inches. 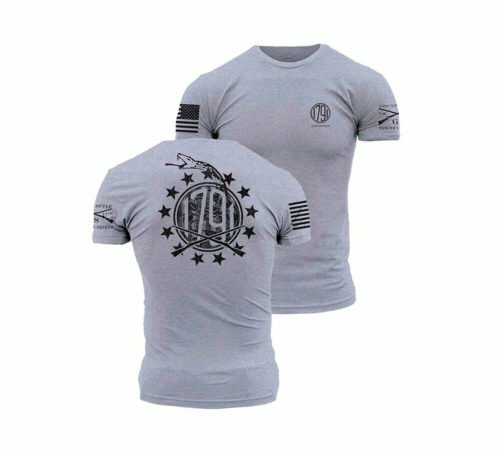 As with all our products, this one is backed by a lifetime warranty, with a 100% satisfaction guarantee and no-hassle returns. 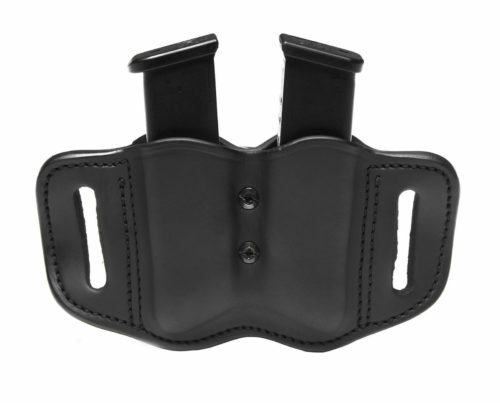 Wondering if your magazine will fit in our Single Magazine Double Stack holster? Note: Works best with Polymer magazines, Metal variations can be loose depending on the model. Can be adjusted by placing fabric or Velcro on the inside. Trying to decide which type of holster to buy? Leather may be the oldest type of holster material, but it’s still considered the gold standard. Nothing beats the look, feel, and smell of premium genuine leather straight out of the package! Beyond that, leather is quiet and discreet for the draw and comfortably molds to your hip with wear. 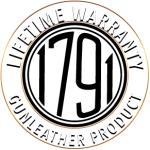 1791 Gunleather uses a particularly thick slice of top-quality cowhide for all our holsters. To keep your leather magazine holster looking and functioning its best over the years, avoid extreme heat, humidity, dampness, and dry air to prevent cracking and dry rot. Resist the temptation to use commercial leather treatments on your holster, which will soften things up too much. 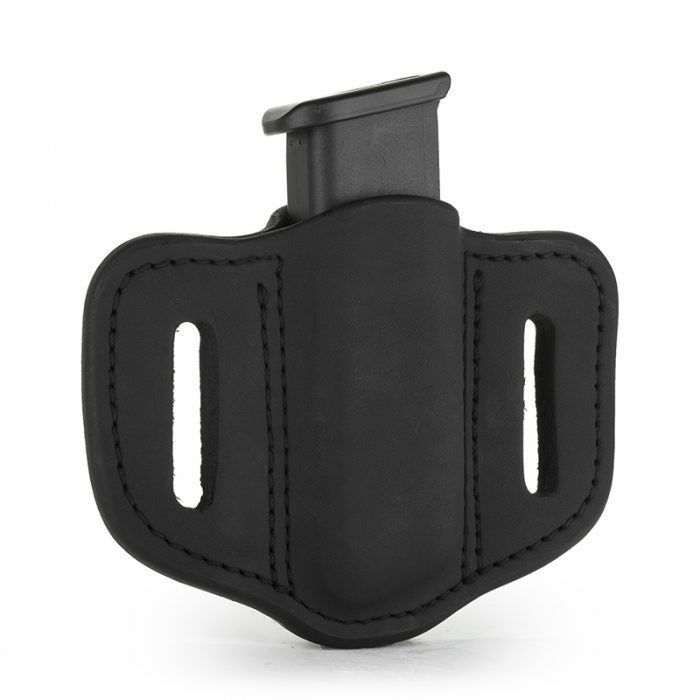 Leather holsters require a certain amount of rigidity to maintain excellent retention. Other than leather, there are virtually indestructible synthetic holsters like Kydex for combat operations, fast-drawing synthetic hybrids, and Nylon. In our humble opinion, nothing beats the benefits of leather gun and magazine holsters. When you need to carry an extra 7-10 rounds, this magazine holster will do you just fine. Made with 100% Certified-American heavy native steerhide, you’re investing in a quality piece of premium leather that will survive a tremendous amount of wear-and-tear. 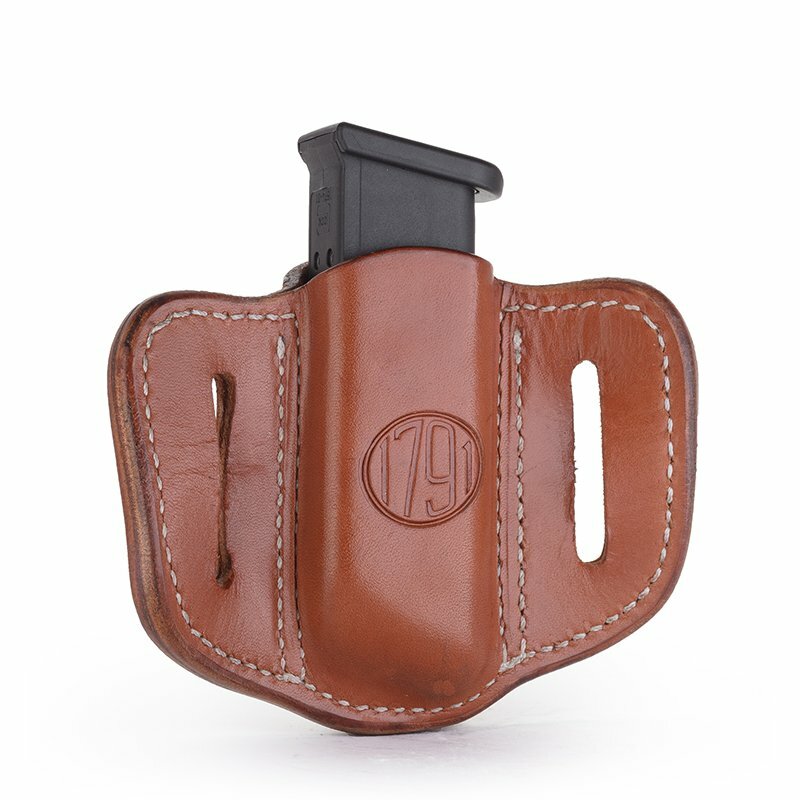 Our holsters are designed for maximum comfort and all-day wear, with curved and widely spaced belt loops, and put together by fourth-generation leather craftsmen who know how to double-stitch a durable product. You can rest easy at night with a LIFETIME warranty on the workmanship. 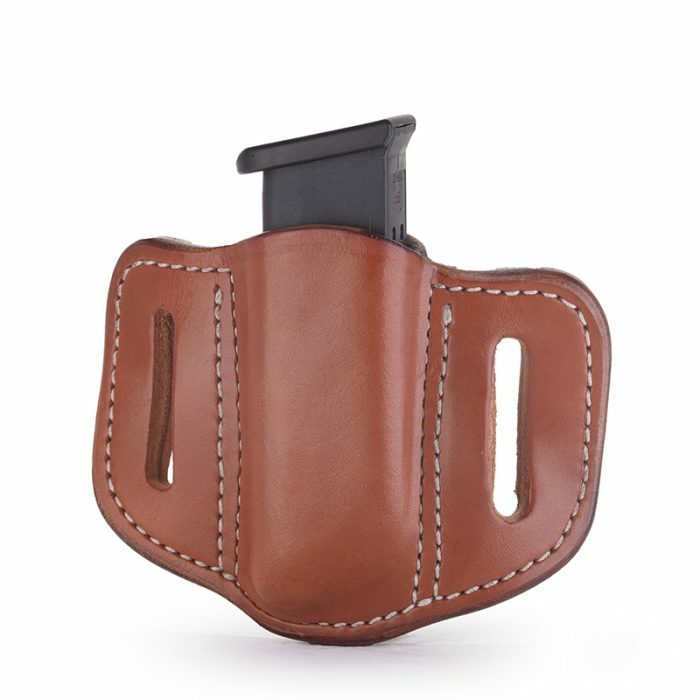 This particular leather magazine holster needs no additional retention devices – no buttons, straps, or locking mechanisms. The open top holster design allows you quick access to your firearm when you want or need it. The natural friction between two pieces of finely stitched leather, along with the custom wet-molding process, ensures that your weapon and magazine remain firmly in place. Contact 1791 Gunleather if you have any questions on the Single Magazine Holster for Double Stack Mags or any other type of holster to carry your firearm and ammunition.